Normally carrying a crew of four the rigid inflatable is launched and retrieved by a Ro-Ro trailer and special tractor unit. Lyme Regis RNLI volunteer crew members operate an 8.5m Atlantic 85 class inshore lifeboat capable of speeds up to 35 knots. The Spirit of Loch Fyne arrived on station in March 2012. She is fitted with the latest technology including radar and VHF direction finding equipment and carries a crew of four. The Atlantic 85 can operate safely in daylight in a Force 6/7 and at night in Force 5/6 and is fitted with two 115hp Yamaha engines and has endurance at sea of three hours at maximum speed. Lyme Regis Lifeboat Station has a crew of some 30 men and women volunteers from all walks of life including builders, carpenters, students, decorators, an accountant, a developer and retired businessmen. Led by the Duty Deputy Launching Authorities, (DLA's) under the supervision of the Lifeboat Operations Manager. Launches are initiated and co-ordinated by MCA. Every station member is on call 24 hours a day, seven days a week. Lyme Regis RNLI lifeboat launched today at 11am after reports of two people in the water and a sinking boat at Seaton, Devon. The volunteer crew arrived on scene within ten minutes of launching by which time one person had reached shore safely and the other had been recovered by a passing fishing vessel and then transferred to the Sidmouth independent lifeboat. Both people were met by an ambulance team ashore. The lifeboat crew managed to recover the sinking 20 foot vessel and towed the boat back to Lyme Regis where more crew were able to work with the harbourmaster’s team to recover the boat to safety. It was reported that the boat had hit the harbour wall when trying to leave Axmouth harbour near Seaton. 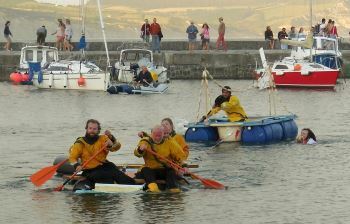 Lyme Regis lifeboat helm Jon Broome said: ‘Our crew were quick to launch and get to Seaton in a flat sea. Thankfully the two people were safely ashore when we arrived so we could focus on recovering the damaged boat. A change of name, nearly £67,000 raised for the charity last year and plans a for a better-than-ever Lifeboat Week in 2019. These were the highlights of the annual meeting of the Lyme Regis and Charmouth RNLI Guild last night (Weds). After decades as a Guild the volunteers, who form the fund-raising branch of the RNLI, are now members of the Lyme Regis and Charmouth Lifeboat Supporters Group. Members voted for the name change and now plan an open day at the lifeboat station in a bid to raise the profile of the group and attract new members. Mr. Lavery praised a ‘superb’ committee and said plans were now under way for a better than ever Lifeboat Week with many old and new events. 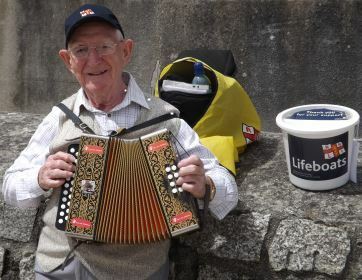 Treasurer Brian Cursley reported that the group had raised a total of £66,806 for the life-saving charity during 2018, including £35,152 during Lifeboat Week. The meeting heard that takings at the lifeboat shop on the Cobb totalled £138,203 and it had been the best performing RNLI shop not attached to a museum or visitor experience centre. Lifeboat Operations Manager Nick Marks told the meeting that the volunteer crew members had answered 40 emergency calls during the year. Analysis of the ‘shouts’ showed that most involved missing persons, people cut off by the tide, and broken down vessels. Mr Marks said that because there were locations between Lyme Regis and Golden Cap where the lifeboat could not be beached crew members had to swim ashore to reach people in trouble. He said the question of getting an additional, much smaller boat for use in such situations was being investigated. Volunteer crew members of the Lyme Regis RNLI lifeboat last night (Friday) recovered one of the oddest items in recent years after receiving an emergency call…a batman balloon. The alert was raised when coastguards received a report of’an ‘object’ floating in the water off Abbotsbury. Lifeboat helm Tim Edwards said:’ Obviously from the shore it would not have been clear what this object was. It would have looked very strange, so it was something which had to be checked out by us and the coastguards. ‘When we were close to the object it became clear it was a large helium type balloon with a batman logo. The lifeboat launched at 6.30pm and returned to Lyme Regis at 7.45. This was the fourth call answered by the Lyme Regis volunteers so far this year. The third ‘shout’ of the year today (Friday) was the first for Georgia Robson, only the fourth woman ever to join the volunteer crew of the RNLI’s Lyme Regis lifeboat. Lyme-born Georgia, 24, joined as shore crew just over a year ago and recently qualified as a sea-going member of the team. She said: ”We were called to investigate an unidentified object floating near the promenade at West Bay, so it was just a little worrying as to what we would find. The lifeboat was launched at 11.52a.m.and returned to Lyme Regis harbour an hour later. Members of a coffee club in the land-locked Midlands have sent a donation of £765 to RNLI volunteers in Lyme Regis to mark their part in the rescue of a soldier with a broken leg in 2017. Tim Robinson, now 56, slipped on rocks and staggered for more than two hours in the dark before he was found by the lifeboat crew and coastguards near Golden Cap, east of Lyme Regis in January two years ago. Tim’s parents, Anne and Noel Robinson, are members of the Wednesday Coffee Club at Etwall in Derbyshire and when the club decided to nominate the RNLI as their charity for 2018 they suggested a donation to the Dorset volunteers. 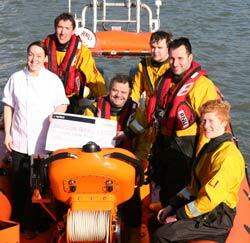 A similar sum was sent to the RNLI team at Exmouth which had hosted a visit from the club. The chairman of the City of Derby Fundraising Branch of the RNLI, William Stanier, gave a talk to the coffee club and received the donation. Tim Robinson spoke of his gratitude to his rescuers at the same meeting. During the rescue two first-aid trained members of the lifeboat crew, Tom Crabbe and Tom Wallis, went ashore to help coastguards assess Mr Robinson’s condition. The lifeboat crew later took Mr Robinson aboard to a waiting ambulance at Lyme Regis harbour. Coastguards and the RNLI in Lyme Regis have issued a stark warning to people risking their lives as they ignore the dangers of the beautiful Jurassic Coast. The latest warnings follow two incidents in which seven people were cut off by the tide, and photographs emerged of a couple and four children climbing in the mud on a cliff at Charmouth. Volunteer Lyme Regis RNLI Lifeboat Operations Manager Nick Marks said: “This latest evidence of people climbing the cliff with children is a serious concern, as is those who become cut off by the tide. “ I fear serious injury, or even loss of life, is a real possibility when people do not take seriously the dangers that the coast presents. The photographs were taken (last Thurs) by a fossil hunter on the beach at Charmouth, who said:”I was horrified to see two adults and four children, all apparently under the age of ten, climbing the cliff. Mud was actually falling off the cliff at the time. Nick Bale, Station Officer at Lyme Regis Coastguard, said today (Sun): “We have carried out six rescues in the space of 72 hours. In all cases the casualties have put themselves in unnecessary danger through lack of forethought and ignoring straightforward advice and signage. Their rescuers have also been put into these dangerous situations. “Coastguard advice remains very clear…do not put yourself at risk by climbing cliffs or investigating muddy areas as you can easily become stuck. If you do become stuck, remain calm and keep as still as you can. Lyme Regis RNLI lifeboat was launched yesterday (Tuesday 19th Feb) to assist coastguards ashore following reports of two people cut off by the tide near Charmouth. The lifeboat crew launched at 5.15pm and were quickly on scene, the casualties were attempting to walk in the shale mud landslides below the cliffs between Charmouth and Golden Cap. One of the volunteer crew swam in to help, they waited for the coastguard rescue helicopter and were winched up and taken to a landing site in Charmouth setup by the local coastguard teams. This was the second emergency call answered by the Lyme Regis RNLI volunteers to assist with people cut off by the tide in the last three days. If you see anyone in trouble in the sea, call 999 and ask for the coastguard. Lyme Regis RNLI lifeboat was launched Sunday, 17 February to assist coastguards ashore following reports of five people and a dog cut off by the tide near Charmouth. The lifeboat crew, who launched at 4.05pm, stood off liaising by radio with coastguards ashore, until a rescue helicopter arrived and landed the people safely on dry land. This was the first emergency call answered by the Lyme Regis RNLI volunteers so far this year. Christmas this year came eleven months early last night (Tues) for the crew of the RNLI lifeboat in Lyme Regis and their families. The film features crew member Georgia Robson as she is about to tuck into her Christmas dinner. Her pager goes off and she runs through the streets of Lyme Regis to the lifeboat station. Coastguard Helicopter Exercise Volunteers with the RNLI’s inshore lifeboat based in Lyme Regis took part in a major exercise with the coastguard helicopter today (Sun). Long distance walker Beth Wilkes called in at the RNLI lifeboat station in Lyme Regis today (Monday) during her marathon journey around the UK coastline. Beth, from the West Midlands, started her trek at Tower Lifeboat Station on the River Thames on 3 October and plans to visit all the RNLI premises during the year. Three members of the crew of the RNLI’s lifeboat in Lyme Regis have made New Year role changes after serving as volunteers for almost a total of four decades. Self-employed carpenter Mark Colley has retired as a helm on reaching the sea-going age limit of 55 in December and after serving for 20 years. He plans to continue as shore crew and to assist with training new recruits. Mark Gage has reluctantly left the crew after moving home to Bridport. In 15 years he served as shore crew, boat crew and boat and tractor mechanic. He works as an energy and environment manager for the Brend Hotel Group. Pete (correct) Cable,24, joined the crew at 17. He left to go to university, returned and has now left to join the Royal Navy where he plans to train to become a Weapons Engineer Officer. 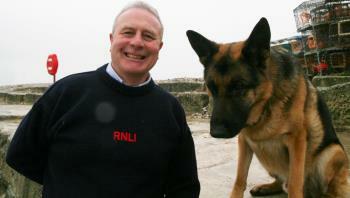 He hopes to assist as shore crew with Lyme Regis RNLI during leave from the navy. Pete’s father John is a long-serving member of the lifeboat crew. The volunteer crew of Lyme Regis RNLI lifeboat answered their 40th emergency call of the year today (Dec 27) following reports of what appeared to be two drifting kayaks a mile and a half to the east of the town’s harbour. The ‘kayaks’ turned out to be large black fenders drifting out to sea south of the Black Ven cliff. The fenders were recovered by the lifeboat crew and taken ashore at Lyme Regis harbour. The lifeboat was launched at 11.30am and the crew returned to harbour half an hour later. 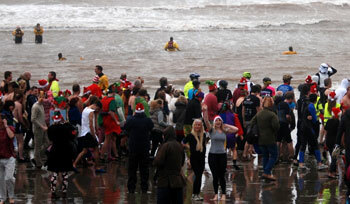 A gloomy Christmas Day morning did nothing to deter spectators and swimmers for the annual display of crazy and colourful costumes and generous donations to the RNLI for the annual fancy dress swim at Charmouth. An estimated 300 people watched as dozens of swimmers – Santas, skeletons, elves and vicars among them – charged into the chilly waves as Lyme Regis town crier Alan Vian announced the start of the popular event. At least £1,500 was raised for the RNLI charity, and the event was supported by the landlords of Charmouth’s Royal Oak pub, Matthew and Sue Bracey, who supplied warming mulled wine for the courageous swimmers. One of the most popular features on the Cobb in Lyme Regis, the dog created from worn - out lifeboat wellies, had a happy event in time for Christmas. With the help, in his garden shed, of long-serving RNLI lifeboat crew member Garry Gibbs, the one wellie dog outside the lifeboat shop has become a family of three. Dozens of Boxing Day visitors to the town took photographs of the dogs, and the next development will be finding a family name. Sixty people- members of the crew, their families and friends – welcomed Christmas yesterday (Sat) at the annual presentation party of the volunteers of Lyme Regis RNLI. Four crew members, who have volunteered for a total of 90 years, received awards. They are Andrew Rice (30 years), and Lance Taylor, Tim Edwards and Brian Street, all 20 years. 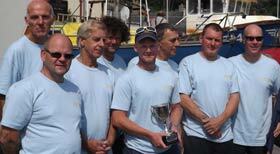 The award for the crew member of year – voted by the crew – went to senior helm Tim Edwards. Somewhat less serious presentations were the Bent Propeller Trophy ‘won’ by Mark Colley and the Man Overboard award to John Rickard. A special award – a photograph of the event – went to three members of the crew who were rescued by their own colleagues in August, An onlooker ashore thought kite surfers Elliott Herbert, Murray Saunders and Rich Tilley were in difficulties when the wind dropped a mile off Charmouth. Lifeboat Operations Manager Nick Marks told partygoers at the Harbour Inn that 2018 had a been a successful year with almost 40 ‘shouts’ , around twice the total for the previous year. More trainees had joined and the crew never once missed a launch because of a shortage of volunteers. Weather permitting, one of the most popular festive events – the Christmas Day swim at Charmouth – is set to draw hundreds of spectators, and those brave enough to take a dip. Fancy dress is not compulsory but vicars, dinosaurs, and crusaders are expected to turn up as usual from 11am on the big morning. The event is planned by the Lyme Regis and Charmouth RNLI Guild and regularly raises in the region of £2,000 for the life-saving charity. Charmouth’s Royal Oak pub is again supporting the swim and will be providing mulled wine for the courageous participants. Members of the volunteer crew of the Lyme Regis RNLI lifeboat will be keeping a watchful eye out during the event which will be subject to a risk assessment of conditions during the morning. The alarm was raised by a woman who was watching the windsurfer from Lyme Regis beach. When she could not see the windsurfer for about 10 minutes, she called coastguards. Lyme Regis lifeboat launched at 1pm and was quickly on scene to assist the exhausted windsurfer. 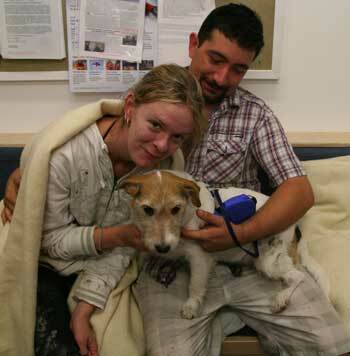 He was taken aboard the lifeboat and returned to the safety of the lifeboat station by 2pm. This was the 38th emergency call answered by the lifeboat crew so far this year. A lone sailor who spent hours at sea in an open boat in bitterly cold conditions was rescued today (Fri) by the volunteer crew of Lyme Regis RNLI lifeboat. The man had been reported in difficulties in a 15ft yacht eleven miles east of the town by Lyme Regis fire chief Virgil Turner who was on a fishing trip. The man was found to be suffering from the effects of the cold conditions and was taken to Lyme Regis harbour by the lifeboat crew where he was met by an ambulance. He was later taken to hospital. After getting the man safely ashore, the lifeboat crew returned to the scene and towed the yacht to Lyme Regis harbour. The lifeboat launched at 8.35am and returned to the boathouse, after two journeys to sea, three and a half hours later. This was the 37th emergency call answered by the lifeboat crew so far this year. A local sailor, Frank Connor, was rescued on Friday 26th October by the volunteer crew of Lyme Regis RNLI when his sailing boat capsized off Burton Bradstock. The lifeboat was launched at 11.25am when Solent coastguards alerted the Lyme Regis crew to a report of a man sitting on the hull of his capsized boat. 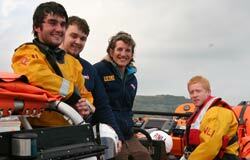 The lifeboat crew took Mr. Connor to meet coastguards in West Bay harbour. Then they returned to right the sailing boat and tow the broken-down vessel to the safety of West Bay harbour and returned to Lyme Regis at 1.30pm. Lyme Regis RNLI lifeboat was launched last night (Tues) to assist coastguards attempting to trace two people reported to be ‘lost’ on cliffs west of the town. The pair – a man and a boy – were spotted from the sea by the volunteer lifeboat crew, and coastguards ashore were then able to meet them at Pinhay Bay. The skipper of a 16ft speedboat and his two dogs were rescued by the volunteer crew of the Lyme Regis RNLI lifeboat this afternoon (Mon) when his vessel broke down two miles off Axmouth. 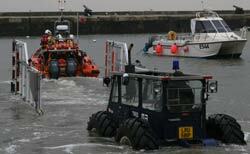 The lifeboat was launched at 2.26pm and the crew towed the speedboat to the safety of Lyme Regis harbour. This was the 34th emergency call answered by the Lyme Regis volunteers so far this year. Coastguards and the volunteer crew of Lyme Regis lifeboat went to the aid of a 71 year old woman who fell on rocks during fossil hunting today (Sunday). The woman, a regular visitor to Lyme Regis from her home in Jersey, was with members of her family, including two grandchildren, when she fell and badly injured her right leg on Monmouth beach west of the town. Coastguards ashore decided it was not safe to carry the woman across stones and boulders and requested the lifeboat to stand off. The lifeboat was launched at 3.03pmand returned to the boathouse at 4.25pm. A coastguard helicopter took the woman to hospital in Dorchester. Two lifeboat crew members went ashore to assist coastguards. The family did not wish to be named. Bridport builder Stephen Harwood was rescued this evening (Fri) by the volunteer crew of Lyme Regis RNLI when his fishing boat broke down off Burton Bradstock. The lifeboat was launched at 5.10pm when Solent coastguards alerted the Lyme Regis crew to Mr. Harwood’s 16ft fishing vessel, named Seamouse. which had suffered engine failure. The lifeboat crew towed the broken down vessel to the safety of West Bay harbour and returned to Lyme Regis at 6.30pm. Three fish suppers held by volunteers in Lyme Regis raised well over £1000 for the RNLI. The town’s sailing club was packed with diners and, with generous help from the Fisherman’s Wife takeaway, a total of £742 was raised. The event, attended by some 60 people, was organised by Trish Wiliams and Di Mattock. At the lifeboat station Petrina Muscroft prepared a lifeboat-themed menu that included Shannon class salmon, Tamara tuna broccoli and chick peas and B class baked potatoes. More than 30 people were served in two hours and £377 .50 was raised. A third event at the Nag’s Head pub, where owners James and Rebecca De-Voisey were generously supported by Matt from Herbies Dino Bar, raised £200. Some 33 tickets were sold for fish and chips, scallops and chips and double cheeseburger and chips. Lyme Regis lifeboat launched in rough sea conditions on Friday (12 October) to a report of a person in the water near Chesil beach. The lifeboat volunteer crew responded to a call from the Coastguard following a report of a person in difficulties. 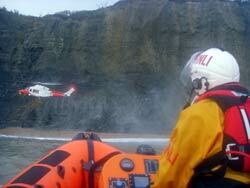 The crew were contacted by the Coastguard at 3.35pm. Half an hour later the crew were stood down when a local coastguard response team reported it was not a person in the water. Lyme Regis lifeboat launched this afternoon (Thursday 10 October) to a report of a boat drifting with three children aboard. Lyme Regis lifeboat volunteer crew responded to a call from the Coastguard to a report of a boat with three children being blown off shore near West Bay. The crew were contacted by the Coastguard at 3.49pm to assist a reported drifting boat. Twenty minutes later the crew had arrived on scene to find the children had made it safely to shore and all were safe and well. The call came from a member of the public who thought the children were struggling against the wind. Lyme Regis lifeboat hosted Dorset Mayors at the station as part of the Lyme Regis Town Councils Civic Day. Lyme Regis Town Mayor Michaela Ellis welcomed about 40 Mayors, Chairman, Deputy Mayors and other dignitaries from across the county as part of Civic Day. The notable representatives were taken on a tour of the lifeboat station, the lifeboat and tractor and received a presentation on the importance of training and equipment required for the volunteer crew. Nick Marks, Lifeboat Operations Manager said, “We were very happy to welcome the representatives from Dorset councils which has enable us to highlight contribution of our volunteers in saving lives at sea, RNLI fundraising and promoting the wider RNLI initiatives for community safety”. Tributes have been paid to Irene Roper, former chairman of the Lyme Regis and Charmouth RNLI Guild, who died during this year’s Lifeboat Week. Irene was a member of the guild for nine years and chairman for four. She was passionate about Lifeboat Week, in particular, and it is estimated that during her spell as chairman no less than £156,000 was raised for the RNLI charity. Irene moved to Lyme Regis from North London eleven years ago. Her partner, David, died three years ago. Irene had three sons, Matthew, Stuart and Daniel and seven grandchildren. In April this year it was announced that Irene was to receive the RNLI’s Excellence in Volunteering Award. It will now be accepted by her sister, Maggie and son Daniel at a ceremony in London in November. Irene was also a supporter of the Royal British Legion. Lifeboat week proceeds for the RNLI charity in Lyme Regis were boosted by £200 today (Sun) when the town’s bowls club presented a cheque during a crew training session. 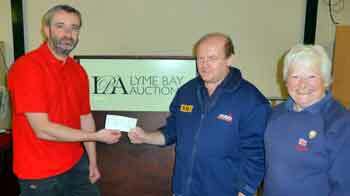 Club captain Alan Nabarro handed the cheque to the chairman of the Lyme Regis and Charmouth RNLI Guild, Ken Lavery. 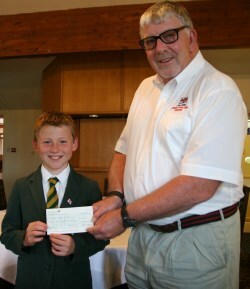 The donation was raised during a lifeboat week bowling drive. 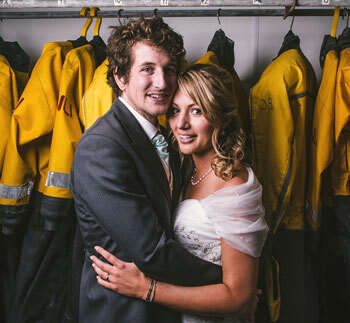 Donations to the RNLI come in all shapes and sizes and for all sorts of reasons. And every one is greatly appreciated by the charity that saves lives at sea. The volunteers of the Lyme Regis RNLI lifeboat crew received a cheque recently from Mrs Ann Rawlins living in Borough Green, Kent. She wrote:’ I had the dubious pleasure of reaching my 70th birthday recently, and, even more extraordinary, celebrating a golden wedding anniversary! 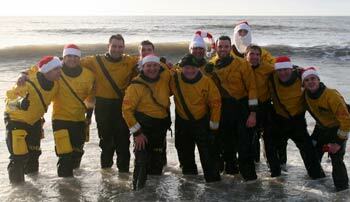 ‘We asked for donations, in lieu of presents, for the RNLI, a much worthier cause than us ! Most of our friends have donated online, thus increasing the donation with gift aid. Mr. and Mrs. Rawlins were married at Uplyme church and her parents retired to Lyme Regis. Her father, best known as ‘Spud’ Taylor, was commodore of the sailing club. Two evenings of fish suppers are being held in Lyme Regis in a tasty fundraising event in aid of the RNLI. The first is on Friday October 12 from 6pm at the town’s sailing club. Fish and chips are on the menu at £10 per person with £5 of the cost going to the lifeboat charity. Next evening, October 13,th there’s a varied menu at the lifeboat station prepared by Petrina Muscroft. Dining is between 4pm and 8pm with a menu of fish chowder and bread, salmon and new potatoes, tuna chickpea and broccoli salad and vegetarian pasta. A minimum donation of £6 per person would be appreciated for the meal. To book call 07967145035 or go to noake@talk21.com. A couple who are driving their Porsche 911 to every one of the RNLI’s 238 lifeboat stations made Lyme Regis their 208th destination today (Weds). They are aiming to raise more than £56,000 for the RNLI charity which is £238 per lifeboat station. Details of the Richardsons trip can be found at www.rnli-911challenge.co.uk. One man was rescued by the volunteer RNLI crew of Lyme Regis lifeboat when his vessel capsized on Sunday. The lifeboat was launched at 4.30pm after a concerned onlooker alerted coastguards when he saw the dinghy capsize just outside the harbour. Two members of the lifeboat crew entered the water to assist the man and right the dinghy. Lyme Regis RNLI lifeboat was launched this morning (Mon) following reports of a swimmer in difficulty at West Bay. The lifeboat crew had just left Lyme Regis harbour when coastguards stood them down after it became clear the swimmer was not in danger and the call was a false alarm with good intent. Lyme Regis RNLI lifeboat was launched today to assist coastguards ashore in the search for a man reported missing in the Spittles cliff area to the east of the town. The man was spotted by the lifeboat crew and they assisted coastguards to successfully reach the man. The lifeboat launched at 12noon and returned to the boathouse one hour later. Two men reported to be exhausted aboard a yacht in storm force wind conditions were rescued by the volunteer RNLI crew of Lyme Regis lifeboat last night. (Friday). The men, who were sailing from Salcombe to Portsmouth, were in difficulties five miles south west of West Bay. A lifeboat crew member boarded the 24ft yacht and assisted the men to sail into West Bay harbour. The lifeboat crew launched at 9.41pm and returned to Lyme Regis at 12.35a.m. A former RAF officer who is now Operations Manager with Lyme Regis Town Council has joined the crew of the town’s RNLI lifeboat as a Deputy Launching Authority. As a Flight Lieutenant, Matt Adamson – Drage,46,was an Aerospace Battle Manager with the RAF until retiring last year after 20 years service. Matt is married to Zishan, deputy town clerk of Axminster, and they have two children, Theo, 4, and Jacob, 7. 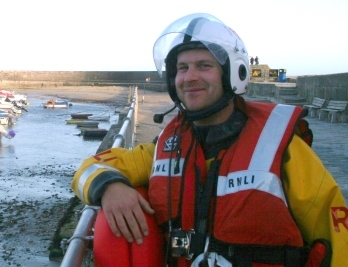 Matt’s position with Lyme Regis Town Council was previously held by another member of the lifeboat crew, Elliot Herbert. Lifeboat Week in Lyme Regis this year has set an all-time record with a final total raised for the lifesaving charity of £34,765. Members of the organising group, the Lyme Regis and Charmouth RNLI Guild, along with lifeboat crew members, heard the news from treasurer Brian Cursley at their meeting last week. Guild secretary Maggie Sullivan said new events this year had proved very popular and despite poor weather at the beginning – with just one or two events being re-scheduled – it had been an exceptionally successful week. The top ten achievers in relation to donations and participation were the water or wine stall, the programme, fireworks display, breakfast baps, the duck race, Red Devils, the book stall, yard of ale, name the yellow welly dog and the swimming challenge. Guild chairman Ken Lavery said: “ The hard work and dedication of all our volunteers has produced a remarkable result this year and the RNLI – the charity that saves lives at sea - will be proud of their efforts. “The generosity of all those visitors and residents who donated to our charity must also be praised. “But there was also sadness, and we pay tribute to Irene Roper, former chairman of the Guild, who died during this year’s Lifeboat Week. Lyme Regis lifeboat launched on Saturday afternoon (25 August) to a report of a missing swimmer near Burton Bradstock. The lifeboat crew were requested to assist coastguards searching for the swimmer . The volunteer crew launched at 12.35pm and began a searching along the coast from West Bay to Burton Bradstock. The report from coastguards was that a man and woman had set off from Freshwater and were swimming to Burton Bradstock. However the woman did not arrive. She was found safe and well by coastguards carrying out a shoreline search. The lifeboat returned to station and was ready for further service by 2.00pm. The volunteer crew of Lyme Regis’ RNLI lifeboat to-night answered their 22nd call for help so far this year from two men aboard a 21 foot yacht with engine failure. The crews’ pagers sounded the alarm at 7.25pm, and the lifeboat was quickly alongside the yacht a short distance east of the harbour. The lifeboat crew towed the yacht to the safety of the pontoons just outside the harbour. Lyme Regis lifeboat launched this afternoon to a man cut off by the tide. The lifeboat crew were requested to assist the coastguard to rescue a man reported to have been cut off by the tide near Golden Cap. The lifeboat returned to station and was ready for further service by 4.30pm. This was the 21st emergency call answered by the Lyme Regis lifeboat crew so far this year. Lyme Regis lifeboat launched yesterday (Monday 6 August) to a report of a broken down small fishing vessel. Lyme Regis lifeboat volunteer crew were tasked to assist the Coastguard with a stranded fishing vessel with two people aboard. The boat was reported to be 4 miles south of Lyme Regis. The volunteer crew were quick to launch after being contacted by the Coastguard at 6.20pm to assist a fishing boat that had suffered power failure. The inshore lifeboat headed south from Lyme Regis to the position of the stricken vessel. The crew set up a tow and were soon back in Lyme Regis harbour where the casualty boat was recovered. The lifeboat was back in the station by 7.30pm. A soggy start with rain and high winds turned into a sunny finale for Lifeboat Week in Lyme Regis. And as the week came to an end yesterday (Friday) the organisers – the Lyme Regis and Charmouth RNLI Guild – reported an early estimated total for donations in the region of £26,000. The weather caused the postponement of the bathtub race and the swimming challenge but both were held later and cancellations were few. Chairman of the RNLI Guild Ken Lavery, said: ’The week was a resounding success and a tribute to all the volunteers who gave up their time in the planning process and during the week itself. Among the many successes, drawing huge support were the Army’s Red Devils parachute display team, the popular wine or water raffle, the ‘name the welly dog’ competition and the tug ‘o war across the harbour mouth which was started by Lord Julian Fellowes, creator of Downton Abbey who was aboard the harbourmaster’s launch with his wife Lady Emma. A Madagascan tortoise stole the show at a packed Uplyme Village Hall presentation of snakes and exotic reptiles. Six hundred hot dogs were sold by the lifeboat crew at their barbecue on the harbour slipway. And a local firefighter scored the first ever hole in one at the golf challenge on the harbour’s North Wall. As the week came to a close with a spectacular fireworks display, one of the last events – the swimming challenge from Cobb Gate to the harbour – attracted a record entry of 100…..65 adults and 35 juniors. Fifty hardy competitors took part in the fun run on day two of Lyme Regis’ lifeboat week and defied the wind and rain that caused the postponement of other events. Competitors ran a 2.3k course along the seafront. It was a family success for Alexander Thiele, 55, and his son Thomas,8, holidaymakers from Newcastle. Alexander won the adult section of the race and Thomas was the first under nine year old. First over nine was Jack Braddock, a holidaymaker from near Peterborough. Rain and high winds on the opening weekend of Lyme Regis Lifeboat Week caused the postponement of at least two major events. Today (Saturday) the swimming challenges for adults and children were postponed because of high winds and choppy seas. They will now be held at 7pm and 7.30pm on Friday. The bathtub race on Sunday was also postponed because of poor weather in the forecast and will now be held at 6pm on Thursday. The welcome display by Lyme Regis RNLI lifeboat was held today but without the Shannon class lifeboat from Exmouth. Her volunteer crew were called out this morning to assist a 25 foot yacht which had been dismasted. They towed it to safety in West Bay Harbour. On the way back to Exmouth the lifeboat crew staged a demonstration of the vessels versatility for hundreds on Lyme Regis beach. With BIG apologies but due to the inclement weather we have had to postpone today's swimming challenge. The Swimming Challenge will now take place this coming Friday, 3rd August. Registration between 4pm and 6.30pm at the RNLI kiosk on Marine Parade, the adult swimming challenge starts at 7pm, and the children's swimming challenge at 7.30pm. In addition, the Great Bath Tub Race scheduled for tomorrow, Sunday 29th July will now move to this coming Thursday, 2nd August at 6pm, with registration at 5pm at Cobb Gate. Fingers crossed for better weather for us going forward and thanks for your understanding. Volunteers at the RNLI lifeboat station in Lyme Regis dealt with two incidents today (Weds). The lifeboat was launched at 2.36pm after reports that two people were possibly in difficulties on an inflatable and in a kayak 400metres off Freshwater east of Lyme Regis. The lifeboat crew established that a man and a woman who were both still at sea were safe and not in trouble. 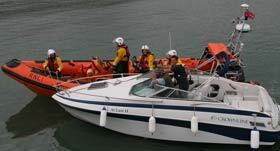 As the lifeboat crew were returning to Lyme Regis harbour they were asked to assist a couple aboard a 42 foot yacht. A mooring chain had wrapped around the rudder. The crew released the chain and then towed the yacht to a safe mooring. 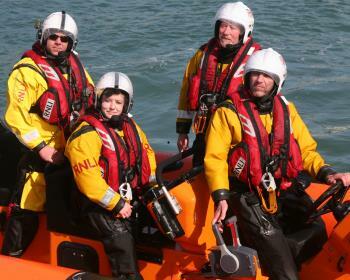 The Lyme Regis RNLI volunteers have now answered 17 calls for help so far this year. Lyme Regis lifeboat launched yesterday evening (Sunday 22 July) to a report of an overturned boat. Lyme Regis lifeboat volunteer crew responded to a call from the Coastguard to a report of an overturned boat 300m off shore from Monmouth Beach. The volunteer crew were contacted by the Coastguard at 8.30pm to assist a reported capsized boat, 10 minutes later the crew had arrived on scene to find the boat was the correct way up and the owner of the boat was fine! The call came from a member of the public who thought that the boat has capsized. A weekend stay in a holiday cottage in Lyme Regis is a new star prize donated for the town’s lifeboat week which starts on Saturday. The cottage sleeps six, and tickets at £5 to win the prize will be available at the lifeboat week kiosk on Marine Parade or at the wine or water stall outside the RNLI shop on the Cobb. The weekend can be between October and May and the prizewinner will arrange dates with the owner. The draw for the prize will take place on August 3rd. A lifejacket ‘clinic’ aimed at ensuring that the safety aid is in perfect condition to save lives is to be held by the RNLI during Lyme Regis Lifeboat Week. 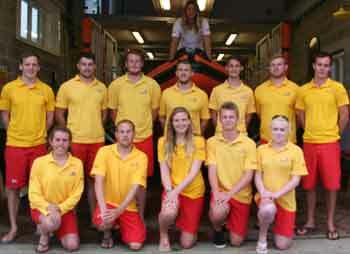 The clinic is being organised by Mike McAlpine, volunteer Community Lifesaving Officer with the RNLI in Lyme Regis. It will be based at a lifesaving gazebo on the slipway by the entrance to the RNLI boathouse on Tuesday July 31st. Mike McAlpine said:’ The tragedy in Missouri recently where eleven people drowned reminds us of the importance of lifejackets. ‘Unfortunately, many people do not check the condition of their lifejackets from one season to another, and in many cases the inflation device fitted may not work when it is needed. Among the tips for lifejacket users is to inflate the aid manually with a hand pump every six months and to leave it inflated for 24 hours to ensure there are no leaks or damage. Lifejacket owners are urged to visit the slipway gazebo on July 31st where RNLI experts will demonstrate how to ensure a lifejacket is in a serviceable condition to save a life. A 35 year old paramedic last night qualified as the latest volunteer to become a member of the sea-going crew of Lyme Regis lifeboat. 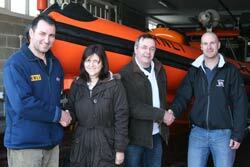 And on the same day his 17 year old son joined the crew and went to sea in the RNLI lifeboat for the first time. Mark Ellis, from Uplyme, has been a crew member for two years and has now passed the final part of his sea-going training. Dad Mark, a paramedic with South West Ambulance, added: ‘ I am delighted and relieved to have got through training and very pleased for Sam who has been nagging me to join the crew at the first opportunity when he became 17. And that was only last month! The Colyton Tractor run is an annual event and this year the monies raised was split between the RNLI and The League of Friends Axminster Hospital. Crew from Lyme Regis were in Uplyme to welcome the participants and drivers on a very hot May bank holiday. 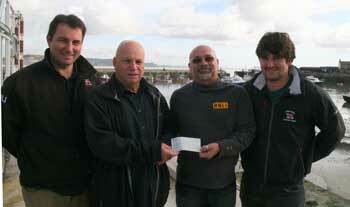 Pictured Colyton Vintage Tractor run committee Arthur Parsons, organiser of the Tractor run presenting a donation of £1750 to Seb Cope from Lyme Regis RNLI lifeboat station and Kevin Salter presenting a donation of £1750 to Dr Barry McKenna from the League of Friends. Downton Abbey creator Julian Fellowes is to make a guest appearance during the Royal National Lifeboat Institution Lyme Regis Lifeboat Week. Lord Fellowes of West Stafford, who lives in Dorset and was appointed Deputy Lieutenant of Dorset in 2009, will be visiting the town on the fourth day of Lifeboat Week, Tuesday July 31st. Lord Fellowes visit to Lifeboat Week will include meeting the volunteer crew at the lifeboat station and fundraisers running many of the events on the day. Lifeboat Week, which is organised by the Lyme Regis and Charmouth RNLI Guild and the lifeboat crew, raises an average of £30,000 each year. Plans for a barbecue and a night camping on the beach went disastrously wrong last night for a young couple. A man and his girlfriend in their 30s, from Colyton, were trying to beach their 14ft speedboat when it was swamped by waves and holed on rocks at Charton Bay, west of Lyme Regis. The speedboat’s skipper, who did not want to be named, said:’ We both tried for about two hours to get the water out of the boat, but in the end it was a write-off and I had to call for the lifeboat. A 26 year old electrician yesterday (Thurs) achieved his ambition to follow in his father’s footsteps to become a volunteer helm commanding the Lyme Regis RNLI lifeboat. Father of two Tom Crabbe, from Uplyme, passed the final test to become a helm during a day of theory and ninety minutes at sea under the close scrutiny of an RNLI assessor/trainer. Tom, a crew member for six years, is now the seventh helm at the Lyme Regis station, one of the most important and responsible roles. Said Tom:’ I am absolutely delighted to have made the grade as a helm, and proud to follow my dad.’ Tom’s father Rob, retired from the lifeboat crew after 20 years’ service and was also a helm. The volunteer crew of the Lyme Regis RNLI lifeboat were yesterday(Sun) called to assist following reports of a powerboat incident at West Bay. The incident occurred during an offshore circuit powerboat racing event. The lifeboat crew were alerted at 2.30pm and arrived 15 minutes later at West Bay harbour to assist coastguards, the Devon and Cornwall Air Ambulance and the police. The tower arrived this week ready for the lifeguards who will be operating from July 7 until September. Nigel Jones, the RNLI’s Area Lifesaving Manager for Torbay to Weymouth, said: ’The RNLI would like to express its sincerest gratitude for all the local support for the establishment of a new lifeguard tower in Lyme Regis. ‘The new, temporary tower replaces the old unit which was at the end of its operational life and provides significant improvements for the delivery of the lifeguard service in Lyme Regis, including vastly improved visibility. The lifeguards can now see over a very crowded beach to the water and beyond to the harbour wall which is a popular location for youngsters jumping into the sea. ‘It is also a more conspicuous facility which provides an extremely useful first aid and information service and a focal point for lost children, plus better more modern welfare facilities for the lifeguards. 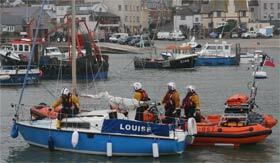 Lyme Regis lifeboat launched yesterday morning to a report of a broken down 6 metre dive boat. Someone, it seems, has taken a shine to the eyes of the yellow welly dog that has become a major attraction outside the RNLI lifeboat shop in Lyme Regis. Shop manager Krys Lavery discovered both eyes were missing and called in the dog’s creator lifeboat crew member Garry Gibbs. Garry performed complicated ‘surgery’ and the dog is now back on duty…on loan to the RNLI stand at the Royal Cornwall Show where he is advising dog owners how to keep safe during cliff top walkies. With the help of Krys Lavery, Garry chose a pair of silver ‘spangly’ beads from another necklace and restored the dog’s appearance. Now Garry needs just two more pairs of worn – out RNLI wellies to start work on a friend for his original creation. The yellow welly dog will be the subject of a naming competition during Lifeboat Week in Lyme Regis, starting on July 28. Lyme Regis RNLI lifeboat was launched this evening (June 3) to assist police and coastguards in a search for an elderly man reported missing. The volunteer lifeboat crew launched at 6.20pm and carried out a widespread shoreline search stretching from Golden Cap in the east to Monmouth beach in the west. Coastguards stood down the lifeboat crew after almost two hours when nothing had been found. This was the 12th emergency call answered by the volunteer Lyme Regis RNLI crew so far this year. Lyme Regis RNLI lifeboat crew were alerted last night (May 8) following reports of a man missing in the West Bay area. The lifeboat was launched at 8-15pm, but after carrying out a shoreline search for ninety minutes nothing was found and coastguards stood the crew down. Lyme Regis RNLI lifeboat was launched at 2.15am this morning (8th May) to assist in the search for a person reported missing in the Golden Cap/West Bay area. 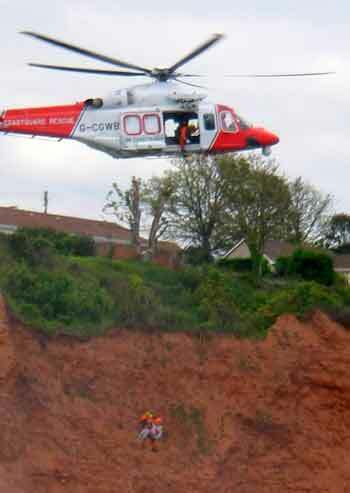 Remember if you see or hear someone in distress in the water, call 999 and ask for the coastguard. The annual blessing of the boats service on the Cobb in Lyme Regis yesterday was just one of many events to benefit from the glorious Bank Holiday weather. An estimated 200 people joined in the open air service led by the vicar of Lyme Regis, the Rev. 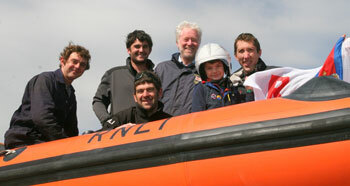 Jane Skinner, and hosted by the RNLI at the lifeboat station. 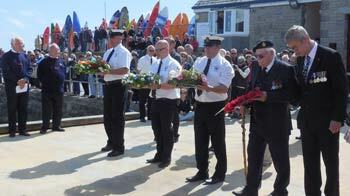 The volunteer lifeboat crew, the British Legion, coastguards, the sailing, powerboat and gig clubs were all represented. Lyme Regis Town Band and the Harbour Voices choir took part in the service and Sophie Vernon, whose parents are members of the gig club, read her poem called Salt. 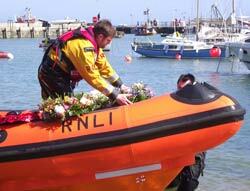 The service concluded with wreaths being taken to be laid at sea by the lifeboat crew. 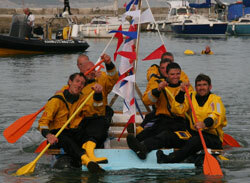 Lyme Regis RNLI volunteers had the honour of starting the 31 day Mayday Yellow Welly Relay today. At 4pm the welly set off by car from the harbour with Lifeboat Operations Manager Nick Marks, his wife, Anne ,and Deputy Launching Authority Ian Marshall and his wife Anne-Marie, on the first leg of the relay to meet members of the West Bay branch of the RNLI. Next the welly was driven to Weymouth lifeboat station to be handed over to volunteers there for the second leg. RNLI volunteers around the South and South East coast are planning their route for the iconic Yellow Welly, which will end its journey on 31st May on the Thames in Teddington raising money and awareness for the charity that saves lives at sea. The RNLI’s Mayday event began today (Tuesday 1 May) and will run for the whole month, with fundraising taking place across the whole of the UK and Ireland. This year, the RNLI hopes to raise £750,000 through Mayday, which will be used to fund essential kit for the charity’s brave volunteer lifeboat crews. Money raised through Mayday fundraising events will help RNLI lifeboat crews to face the harshest conditions at sea with the best kit possible. It currently costs £1,598 to provide one all-weather lifeboat crew member with all of the kit they need when responding to the call for help. This year, the RNLI is going yellow for Mayday – just like volunteer crews do every day to save lives at sea. Anyone who wishes to get involved can visit RNLI.org/mayday to register for a free Mayday fundraising pack. The pack provides a host of fundraising ideas, such as encouraging friends and colleagues to get sponsored to run, walk or cycle, cooking up some yellow-themed bakes to sell or even getting together to lift the weight of a 42 tonne Severn class lifeboat! The charity is also encouraging people to show support on their social media, joining the conversation using the hashtag #MaydayEveryDay, or by donating online or buying a yellow crew member pin badge. In 2017, RNLI lifeboat crews across the UK and Ireland launched 8,436 times, assisting 8,072 people. Penny farthing enthusiasts and football fans Seb Cope and his father Alistair cycled from Derby County’s ground to Aston Villa at the weekend for a charity close to their hearts. Seb, 35, a member of the RNLI lifeboat crew in Lyme Regis, and Alistair, 59, from Seaton, raised more than £200 for the Aston Villa Foundation community charity during their 50-mile cycle ride. On the way to Aston Villa the pair stopped at the National Arboretum where Seb paid his respects at the RNLI memorial. At the end of their journey they watched Aston Villa draw 1-1 with Derby County. A former treasurer and shore crew member with the RNLI in Lyme Regis has returned as chairman of the Lifeboat Management Group. Mark Houghton, 57, has just begun a four year stint to co-ordinate the activities of the lifeboat operational team, the fund-raising guild and the RNLI’s beach lifeguards. Mark, who lives near Bridport and takes over from John Dover, who performed the role for 18 months, said:” Another important part of my activities will be as a point of contact for other local organisations or individuals regarding all aspects of the RNLI in the area. The annual blessing of the boats service will be held this year on May 6 at the RNLI lifeboat station on the Cobb in Lyme Regis. Starting at 3pm the inter denominational service will be led by the Vicar of St. Michael’s Church, the Rev. Jane Skinner. The town band and the Harbour Voices shanty singers will feature in the open air service to which all are welcome. Members of the volunteer lifeboat crew, the coastguards, the gig club, sailing club and powerboat club will all be represented. The service will conclude with wreaths, including one from the Royal British Legion, being taken out to sea by the lifeboat crew. 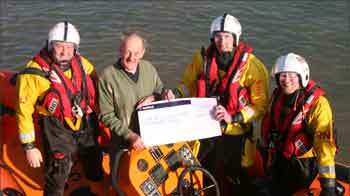 Volunteers in Lyme Regis and Charmouth raised nearly £64,000 for the RNLI during the past year. Another financial success was the lifeboat shop on the Cobb. 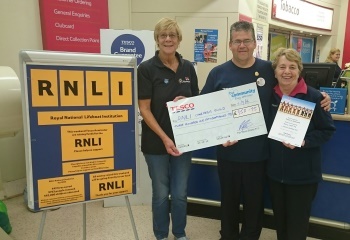 Volunteer manager, Krys Lavery said her second year in charge had ended in a turnover of £126,000 and the shop was seventh in the league table of RNLI outlets. Lifeboat Operations Manager Nick Marks reported on 22 ‘shouts’ during last year and said the crew had already answered eight calls for help in 2018. He said a major refurbishment of the boathouse was now almost complete, and the lifeboat has returned to the station after a month in an industrial tent while the work was carried out. Guest speaker Elliott Herbert, a member of the crew and also Senior Assessor Trainer (lifeboats) England for the RNLI outlined the importance of training for the volunteer crews. Mr Herbert leads a team of 11 responsible for training at 114 lifeboat stations. The meeting ended with praise for the outgoing chairman of the guild, Irene Roper, who received the RNLI’s award for excellence in volunteering. Irene was said to have led the guild in raising some £166,000 during her nine years, five of them as chairman. New chairman Ken Lavery praised her ‘hard work, commitment and sheer doggedness’ as Irene sliced a celebration ‘thank you’ cake. Lyme Regis lifeboat launched this morning (Sunday 25 March) during a training session to a report of a 6 metre broken fishing vessel. Lyme Regis lifeboat volunteer crew were tasked to assist the Coastguard with a stranded fishing vessel with two people aboard. The boat was reported to be 30 miles south-west from Portland. The volunteer crew were on a routine training session when contacted by the Coastguard at 9.50am to assist a fishing boat that had suffered power failure. The Atlantic 85 inshore lifeboat headed south from Lyme Regis for approximately 18 miles to the position of the stricken vessel. The crew set up a tow and 2 hours later were back by West Bay where the helm of the lifeboat Jon Broome had to carefully negotiate manoeuvring around the dredging machine currently in the harbour. The RNLI’s inshore lifeboat based in Lyme Regis moved into her new temporary ‘home’ last night (Weds)…a huge industrial tent on a car park. The boat, Spirit of Loch Fyne, the tractor used for launching and other equipment will be housed in the tent, east of the bowling green, for a month while work to repair the floor of the boathouse on the Cobb is carried out. Volunteer crew members were briefed on arrangements, including safety measures for the move, and also carried out a dry run for launching which will mean the tractor with the boat on its carriage being transported a short distance along a public road to the harbour. Lifeboat Operations Manager Nick Marks said: ’The crew had a detailed briefing on how to manage the next month, including closing the short stretch of road when the boat is being moved for launching. ‘We apologise in advance for any inconvenience to pedestrians and motorists and we will keep any restrictions to a minimum. Lyme Regis lifeboat launched this afternoon to two people cut off by the tide. Lyme Regis lifeboat was requested to launch to assist the Coastguard with two people that were reported to have been cut off by the tide near Black Venn, between Lyme Regis and Charmouth. The volunteers launched the lifeboat at 4.45pm and were on scene in 10 minutes later and assisted the Coastguard to ensure the safety of the people. Murray Saunders, helm of the crew said: 'We were glad to assist the Coastguard with this rescue and thankfully the people made it to safety. If in doubt, leaflets are available from the Tourist Information Centre and RNLI lifeboat shop explaining the risks of the changing tides. The RNLI’s Lyme Regis-based lifeboat is moving ‘home’ for a month during March. The 8.5m Spirit of Loch Fyne will be housed in an industrial tent on a car park from March 7 while the lifeboat station’s boathouse floor is re-laid. The move also includes the tractor used to launch the inshore lifeboat as well as other boathouse equipment. During exercises, or launches to an emergency at sea, a short stretch of road from the car park east of the bowling green to Cobb Square will be closed for a few minutes. The lifeboat will be launched from the harbour’s public slipway while the RNLI’s facility is used by contractors carrying out the repair work. Mr Marks added:’ Crew members will carry out safety measures while the boat is moved on the public road to the harbour. After returning to the lifeboat station at 11.45pm last night (Friday 23rd), the volunteer crew launched again at 02.15 this morning to continue the search for the reported missing man. Senior helm Tim Edwards, in the operations room at the lifeboat station, said: ‘After a report from the police helicopter we were asked to carry out a search about 300metres off the West Bay piers, but found nothing. Lyme Regis RNLI lifeboat was launched last night (Fri 23rd) to assist following reports of a man missing in the West Bay area. Solent coastguards requested the lifeboat crew to carry out a shoreline search in the West Bay, Eype, Freshwater and Seatown areas. Lifeboat Week 2018 is coming! 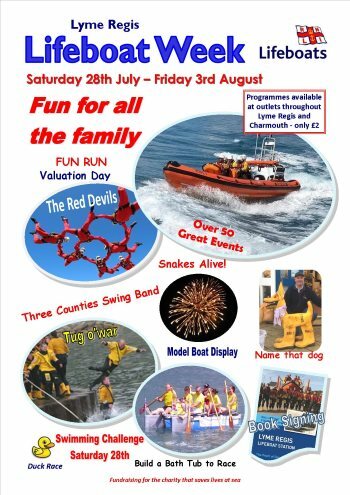 Members of the committee of the Lyme Regis and Charmouth RNLI Guild have already drawn up a provisional programme for the week which this year runs from July 28th to August 3rd. And already confirmed for a return visit are the Red Devils, the British Army’s official parachute display team. They will be ‘dropping in’ during the afternoon of August 2nd. The Guild – the local fundraising branch of the RNLI charity – is holding its annual meeting on April 11th at 7.30pm at Lyme Regis lifeboat station. Guest speaker is long-serving lifeboat crew member Elliott Herbert who is also a full time Senior Assessor Trainer with the RNLI. New members of the Guild are welcome to attend the meeting. A 23 year old general manager has become only the fourth woman ever to join the volunteer crew of the RNLI lifeboat in Lyme Regis. 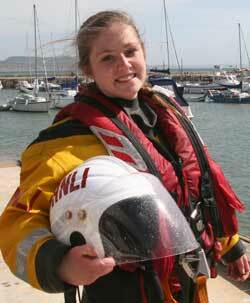 Lyme-born Georgia Robson has enrolled as shore crew and is now attending regular training sessions at the lifeboat station on the Cobb. Georgia, a former Woodroffe School pupil, aims eventually to become a sea-going crew member. She enjoys regular trips with her ex-Royal Marine father Jim, in his four metre RiB (rigid inflatable boat). Georgia applied to join after meeting members of the crew at last year’s Remembrance Day parade. Georgia is general manager with Tukxi Ltd, an Axminster firm which imports and converts Tuk Tuk auto rickshaws. What to do with the Lyme Regis lifeboat crews' worn out yellow wellies was the puzzle for long serving RNLI volunteer Garry Gibbs. Landscape gardener Garry took the redundant footwear home to his workshop. And 8 hours and 7 boots later the result was a dog-shaped model which will become a star attraction during lifeboat week this summer. Garry, a member of the lifeboat crew for 22 years, said " A dog seemed the obvious answer to the recycling issue with the old wellies. I hope to make another animal when more old wellies become available.” Now, organisers of Lyme Regis lifeboat week - starting on July 28 - are planning to run a competition to name this very rare breed and to raise funds for the RNLI charity. Lyme Regis RNLI lifeboat was launched today following a report that two people were thought to be cut off by the tide between Lyme Regis and Charmouth. The alarm was raised by National Coastwatch volunteer Howard Lyne on duty at the Charmouth look-out station. The lifeboat was at sea within seven minutes of the coastguard request to launch at 2.40pm. After a comprehensive shoreline search by the lifeboat crew nothing was found and coastguards called off the operation. Lyme Regis RNLI lifeboat was launched yesterday (New Year’s Day) when coastguards were alerted that possibly up to three people had been cut off by the tide on the beach between Lyme Regis and Charmouth. The volunteer crews’ pagers sounded the alarm at 4.20pm and the lifeboat crew were quickly on the scene east of the harbour. It was soon established that one man was involved and was able to leave the beach, making his own way to safety. He was then met by coastguards ashore and the lifeboat crew were stood down. An award for 30 years’ voluntary service, tongue-in-cheek tributes and a Christmas dinner all contributed to the success of the Lyme Regis lifeboat crew’s annual presentation party last night (Saturday). 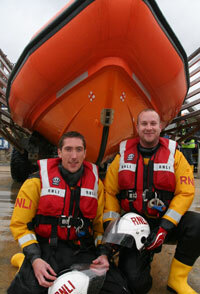 Some 50 people – RNLI crew members, their friends and family – attended the event at the Harbour Inn. Among the awards were the White Star Line award to helm Mark Colley, the Watch Your Language award to John Bird and the Bent Propeller trophy to Brian Street. Consultant surgeon Ken Lavery, who is a Deputy Launching Authority, received a photograph of himself on the ground – not needing hospital treatment ! –after failing to clear a fence during a crew visit to an Exeter Chiefs rugby match. The RNLI’s lifeboat station in Lyme Regis is becoming a regular favourite for organised visits, particularly by school parties from a wide area. The latest visitors (yesterday, Thurs) were 44 nine to ten year olds from Wheatley primary school in Oxford. The youngsters visited the station during their stay at Hooke Court, the residential field study centre near Beaminster. They heard a talk by volunteer Deputy Launching Authority Ian Marshall who told them about the way the RNLI works and discussed beach and water safety. 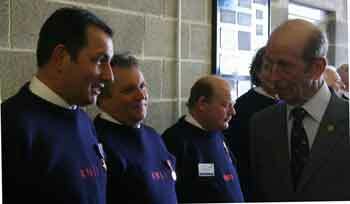 He also gave them a guided tour of the lifeboat station and the lifeboat itself. A party visit can be organised by leaving a message for Mr. Marshall on the lifeboat station telephone number 01297 442230. The first of a series of exercises involving Lyme Regis’ successful gig club and the town’s RNLI lifeboat crew was held today (Sunday). Gig club coach Chris Waller, who is leading a safety management team for the rowers, said:”Our aim is to manage a better culture of safety for gig clubs. Today’s exercise with a gig crew of seven and their 32 foot vessel, Prospero, involved the lifeboat going alongside the gig and a session to practise towing. Future exercises are expected to involve scenarios including capsize, man overboard, swamping, and casualty recovery. The Lyme Regis Gig Club now has 180 members. 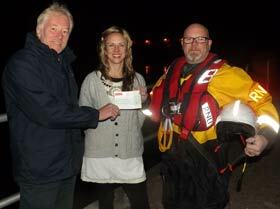 Two fish suppers in Lyme Regis over the weekend raised a total of £454 for the RNLI’s life-saving charity. One was held at the town’s sailing club where at least 54 fish and chip meals were served on Friday evening, and the other, on Saturday, invited diners to a chalet above the bowling green where hostess Petrina Muscroft served fish curry and rice, salmon salad or vegetarian pasta. Diners made a donation for their meals and Petrina, Herbies, Baboo Gelato and the sailing club presented their profits to the crew at the lifeboat station today (Sunday). Volunteers who run the RNLI lifeboat station in Lyme Regis are appealing for new recruits to bring the crew up to full strength. Two Deputy Launching Authorities – DLAs – and three shore crew members are being sought. The DLAs are members of the management team and are the first point of call for coastguards when they make a request for the lifeboat to be launched. They then take charge of the operation in the boathouse during any emergency. Lifeboat Operations Manager Nick Marks said: ”The DLAs tend to be senior members of the team operating on a duty rota, and shore crew should be aged between 18 and 40 with good fitness levels and living and working in Lyme Regis or close by. Training can take up to two years for those who want to be sea-going crew members. 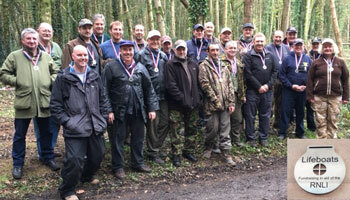 “Everyone is a volunteer and training and other events can account for around 12 hours a month. Anyone interested in joining the crew should call 01297 442230 and leave a message or come along to the next training session at the lifeboat station at the harbour from 9a.m. on Sunday October 15th. Lyme Regis lifeboat launched in early hours to rescue 5 teenagers from stricken yacht. Lyme Regis lifeboat was requested to launch to assist a 35' sailing yacht that had broken free from its mooring off Lyme harbour at 2.45am this morning (Wed). 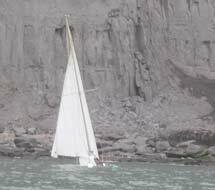 The sailing boat had drifted towards the shore and ran aground on the beach near Lucy's Ledge in Lyme Regis. There were seven people on board including five teenagers. The lifeboat launched and was alongside the casualty vessel 15 minutes after the Coastguard requested the launch. The five teenagers were rescued off the casualty boat and taken to the lifeboat station, all were safe and well with no injuries. The volunteer crew of the lifeboat then returned to the casualty vessel and managed to tow the boat away from the beach back to a mooring. The boat was a Tradewind 35 sailing yacht called TS Vigilant, part of the Sea Cadets fleet. The boat and crew were on route from Plymouth to Poole, stopping at Lyme Regis for the night. The five Sea Cadets were from the London and Birmingham areas. Helm Tim Edwards said "I was pleased we were able to get the teenagers to safety of the lifeboat station and then recover the casualty vessel from trouble. 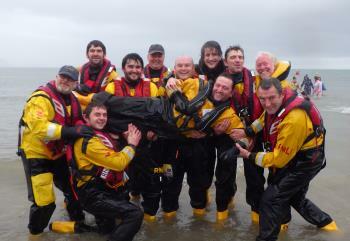 The lifeboat crew performed really well and the all the training we do was put to good use!" Members of the RNLI crew in Lyme Regis and their families and friends got together at the town’s Powerboat Club (last Saturday) for the traditional end of season party and for presentations to former volunteers. 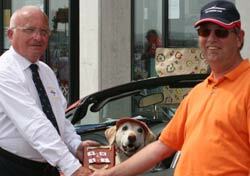 Local builder Dave Street received his award for 24 years service, 14 of which were as helm. During his service with Lyme Regis RNLI the lifeboat rescued 74 people..
Lifeboat week in Lyme Regis this year raised £30,000 for the RNLI charity, the organisers have announced. Treasurer Brian Cursley revealed the figure at last night’s (Weds) meeting of the Lyme Regis and Charmouth RNLI Guild. The top five donation-earning events were the water or wine stall, the glossy programme of the week’s events, the lucky dip, breakfast baps, and the duck race. 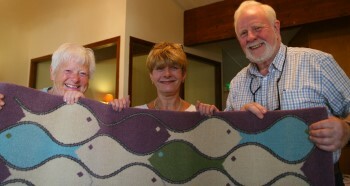 Guild chairman Irene Roper said:”It’s an astonishing result to raise £30,000 this year despite the rain. “Once again, it demonstrates the generosity of visitors and residents alike, local traders and, of course, the hard work of all our volunteers. “Our local media also played an important role in publicising the week extensively. A family of four and their labrador dog were rescued this evening (Tuesday) by the volunteer crew of Lyme Regis lifeboat after their yacht was swamped by waves and sank at Charton Bay, west of Lyme. 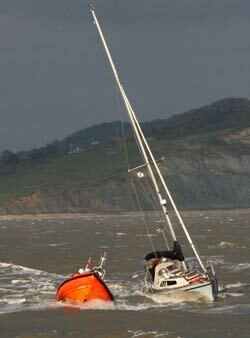 The yacht was being sailed from Lyme Regis by Joe Coles,56,from East Coker, Yeovil. Also on board were his wife Tania, sons Theo,9, Hector,19, and their 14 month old Labrador Suki. Mr Coles said: ”We had been having a picnic and were close to shore. Suki would not get on the boat. We got out of the boat to get the dog and two big waves hit the yacht and pretty much sank it. The family had left Lyme in the 18 foot vessel, called Llewellyn, just as the Red Devils were giving their display as part of Lifeboat Week. 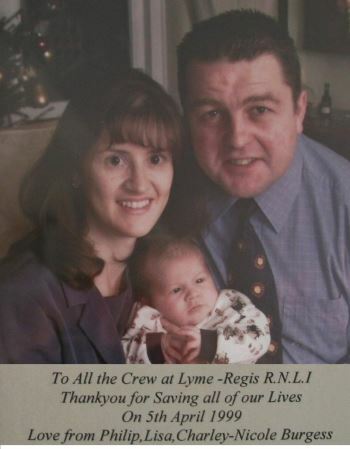 The lifeboat crew brought the family back to the safety of Lyme Regis. 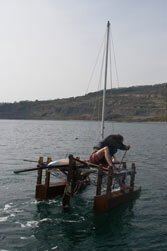 Later it was decided it was too unsafe to tow the stricken yacht back to Lyme Regis. The lifeboat crew secured the yacht by anchor a quarter of a mile off Pinhay Bay. This was the 13th shout for the Lyme Regis crew so far this year. The lifeboat had launched from the slipway at 6.50p.m.just as the Lifeboat Week charity auction was under way in the boathouse. But later the water polo match between the lifeboat crew and the lifeguards was affected by a shortage of players. A depleted lifeboat crew team lost by a large margin, according to players. Also among guests at the launch at the town’s lifeboat station will be the parents of a severely disabled young woman who died when her wheelchair fell into the harbour. 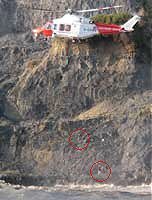 Philip and Lisa Burgess were rescued after the helicopter Philip was flying crashed in dense fog on Easter Monday 1999. Lisa was pregnant at the time, although her rescuers did not know, and her daughter Charley-Nicole will be paying her first visit to Lyme Regis. Mariola Constandinou, from the Midlands, was 71 when she slipped on rocks and was seriously injured near Charmouth in May two years ago and is looking forward to meeting her rescuers again. Mark and Paula Perkins, whose daughter Claire died when her electric wheelchair fell into the harbour will once again be visiting Lyme Regis to help with Lifeboat Week events and will also be at the book launch. Also at the book launch will be John Bradley, the great great grandson of Thomas Bradley a coxswain of the pulling and sailing lifeboats for 30 years, who joined the crew in 1851. Dorset-based actress, impressionist and comedian Debra Stephenson will be opening Lyme Regis Lifeboat Week at 12.30pm on July 22nd and will also be at the book launch. She co-starred in the BBC,s The Impressions Show with Culshaw and Stephenson and currently stars in Radio 4’s Dead Ringers. Richard will be on Marine Parade during the afternoon to sign copies of the new book. 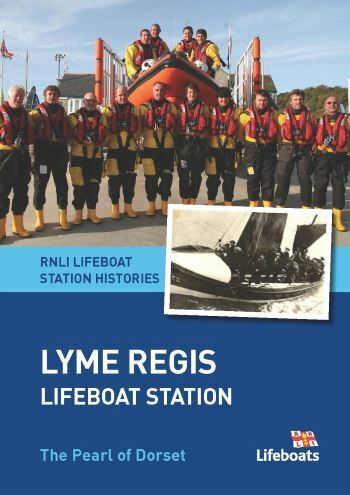 The life and times of Lyme Regis lifeboat men and women – and the lifeboats themselves – are captured in a new book from the RNLI and due to be launched on 22 July, the first day of this year’s Lifeboat Week. Written by the lifeboat station’s volunteer press officer, retired newspaper and BBC journalist Richard Horobin, the fully illustrated book is part of the charity’s history book project. It tells how a makeshift lifeboat service started in the town in 1826, and how a Christmas tragedy led to Lyme Regis getting a ‘proper’ lifeboat, powered by sails and oars, 27 years later. With much help from local historians and lifeboat supporters, the author has brought to life a fascinating collection of stories about dedicated volunteers who ran a lifeboat service in the town, despite all the odds, over a period of nearly 160 years. How they would row the lifeboat for hours to reach a stricken vessel….no twin 115hp engines such as power today’s lifeboat. There is the crew member who was shipwrecked eight times as a mariner; the coxswain who served the lifeboat for 34 years and was famed for his strength, picking up a man with one arm and placing him on a table. He also salvaged a huge barrel of alcohol from a shipwreck and carried it single handed up a cliff ! The story of an MP who vanished without trace over Lyme Bay after being trapped in a hot air balloon makes incredible reading. The dramatic episode when a ship was torpedoed by a German submarine a short distance from Lyme Regis harbour, and yet had an amusing twist amid the tragedy and chaos. And in more recent times the amazing survival of a couple whose helicopter crashed into Lyme Bay in dense fog; the tragic tale of the severely disabled woman whose wheelchair fell into Lyme Regis harbour and the desperate attempts made to save her. There are the lighter moments, too, such as the crew Christmas dinner when the annual awards are presented…including the Bent Propeller trophy ! The story of Lifeboat Week, from the early 70s, includes the ditching of a Navy helicopter in the sea, which wasn’t part of the event, although the hundreds who witnessed it thought it was. The new book will be available from the lifeboat shop on the Cobb and other outlets in the town, from 22 July price £8.95 with all proceeds going to the RNLI, the charity that saves lives at sea. Dozens lined the slipway in the sunshine at the RNLI lifeboat station in Lyme Regis today to join the annual Blessing of the Boats service. The inter-denominational service, hosted by local clergy the Rev. Chris Woodman and the Rev. Keith Vivian, acknowledges and blesses those who go to sea professionally, or for fun, and remembers those who have lost their lives to the waves. 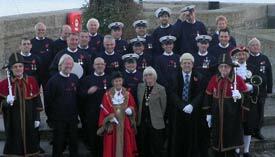 Representatives of the town’s gig, sailing, and powerboat clubs took an active part in the service along with the volunteer lifeboat crew. A poem written and read to the congregation by 11 year old Millie-Jade Ellis, daughter of recent lifeboat recruit Mark Ellis, drew appreciative applause. The service ended with the local club members and the Royal British Legion presenting wraths to the lifeboat crew who then took the wreaths aboard the lifeboat to be laid at sea. A lifeboat crew member on a penny farthing bicycle, a vintage Jaguar, the RNLI’s mascot Stormy Stan and more than a hundred schoolchildren all took part in the Lyme Regis stage of the marathon journey of a yellow welly yesterday (Fri). The illuminated welly is being relayed all along the south-west coast as part of the RNLI’s Mayday fundraising campaign during which the charity hopes to raise £750,000 towards the cost of the kit lifeboat crews have to wear. Members of the Sidmouth branch of the RNLI brought the welly to Lyme in a 1967 S-type Jaguar. It was delivered to pupils at St. Michael’s School, Lyme Regis, and they handed it over to lifeboat crew member Seb Cope who arrived at the school on his penny farthing bike with the RNLI mascot Stormy Stan. Seb and Stan then took the welly to Lyme Regis lifeboat station. Today (Sat) the welly was taken by the Lyme Regis lifeboat crew to Portland Bill where it was handed over to the three-masted tallship TS Pelican and later collected by RNLI volunteers from Weymouth to continue its journey. 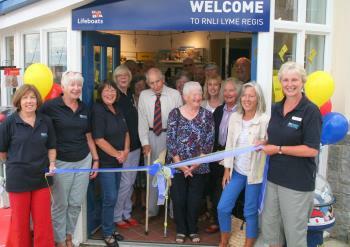 Volunteer fund-raisers in Lyme Regis and Charmouth boosted the RNLI’s income by more than £65,000 last year. Members of the local fund-raising arm of the RNLI – the Lyme Regis and Charmouth RNLI Guild - received the news at their annual meeting last night (Weds) when treasurer Brian Cursley delivered his report. 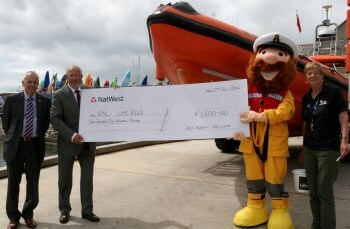 The total included a variety of events and donations as well as £27,000 raised during lifeboat week. Chairman Irene Roper said it had been a record breaking year and she had been heartened by the many messages of congratulations received from the public during and after lifeboat week. Volunteer manager of the lifeboat shop, Krys Lavery, said the outlet had taken £122,000 and was the sixth best performing shop in the UK. In his annual report to guild members, Lifeboat Operations Manager Nick Marks said volunteer crew members had answered 27 calls for help last year and were credited with saving three lives. He said there now appeared to be a familiar pattern of emergencies – almost half of calls for help were from people getting into difficulty ashore when out walking and cut off by the tide or falling on rocks. The other half were incidents involving boating, fishing and surfing. Guest speaker was Nigel Jones, the RNLI’s Area Lifesaving Manager, who told guild members about many changes throughout the organisation’s structure and the aim to reduce drownings around the coast. Volunteer press officer Richard Horobin gave members a brief preview of his book on the history of lifeboats and lifeboat people in Lyme Regis. The book is due to be published in time for this year’s lifeboat week which starts on July 22nd. Volunteer crew members of the RNLI lifeboat in Lyme Regis have taken part in their first exercise with the helicopter team assuming the search and rescue role in the next few weeks. The helicopter crew, from Lee–on–the–Solent, Hampshire, are due to take over from those based at Portland. Two lifeboat crews took part in the exercise during their regular training evening last week. 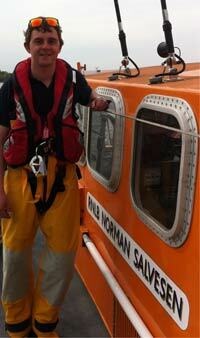 Helm Jon Broome, who is also the lifeboat’s training co-ordinator, said:” The exercise was very worthwhile. 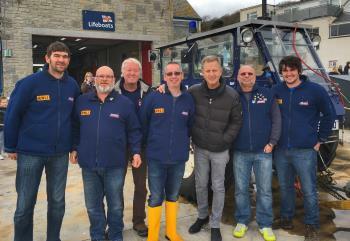 TV presenter Jeremy Kyle popped into Lyme Regis lifeboat station during Sunday morning's training session and met the RNLI crew. He said he was very impressed with the RNLI volunteers and that his mother used to be a volunteer in the lifeboat shop on the Cobb.. He said he liked Lyme very much and that he had his first birthday in the town some 50 years ago and has been visiting the resort ever since. Volunteers who run the RNLI charity shop next to the lifeboat station in Lyme Regis have celebrated another successful year. More than thirty people enjoyed a buffet lunch at the Hunters Lodge, Raymonds Hill, and heard that their shop had been placed sixth in the ‘league table’ of hundreds of lifeboat shops around the country. He said the RNLI’s shops had reached an income of £6,300.000. in 2016.The English Channel division, of which Lyme Regis is a member, had a record breaking income of £1,000.405. 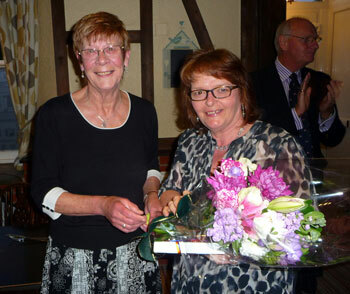 Two presentations for Excellence in Volunteering, were made at the Lyme Regis lunch. Carys Lowe received a framed certificate and letter of thanks for her 15 years as secretary of the Lyme Regis and Charmouth RNLI Guild. 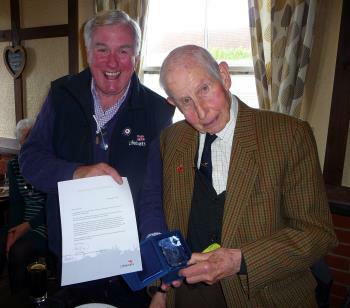 Ross Bennett was presented with a crystal award marking his 23 years as a volunteer in the shop and collector during Lifeboat Week. The RNLI’s letter to Mr. Bennett mentioned how people would seek him out on Red Arrows day in Holmbush car park to hand him a donation. Mr. Bennett has now decided he can no longer work in the shop on a regular basis, but will remain on the reserve list. 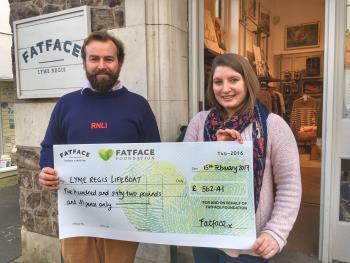 Staff at the FatFace store in Lyme Regis have donated more than £600 to the local RNLI lifeboat charity. The donation was raised during Black Friday weekend in November last year. Staff members added £40 to the £562 raised in store..Under the ‘Thanks for Giivng’ initiatve the FatFace chain nationally donated some £200,00 to charities from its 221 stores. Mike McAlpine, 61, served in many trouble spots including Kuwait, where he commanded a construction squadron involved in the restoration of essential facilities to Kuwait City immediately after the unsuccessful invasion by Iraq, and the ‘clean up’ of unexploded bombs and landmines. Mike, a chartered civil engineer and graduate of Queen’s University, Belfast, spent 20 years in the Royal Engineers, had two spells in the Falklands and commanded a regiment in Northern Ireland for three years before becoming the technical authority for UK counter landmine warfare. Mike, married to Karen with three daughters, moved to Lyme Regis from Dalwood, near Axminster, in 2014. His last job was with BP in Iraq where he was involved in opening up the second largest oilfield in the world at Rumaila, south of Basra. Members of the RNLI’s volunteer lifeboat crew in Lyme Regis and their families and friends got the new year off to a celebratory start with their annual awards dinner. The event at the By the Bay restaurant yesterday (Sat) was attended by around 70 crew members and their guests. Among the awards was a long service certificate to landscape gardener Garry Gibbs, a crew member for 20 years. Senior helm Tim Edwards was voted crew member of the year, and the much coveted bent propeller trophy went to helm Mark Colley. 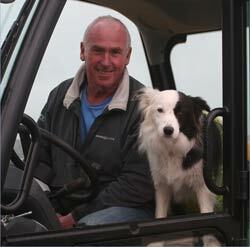 A new award, Anchor Aweigh, went to tractor driver Richard Beviss. Another new award, for their conscientious ‘office’ work, went to John Cable and Mark Gage. 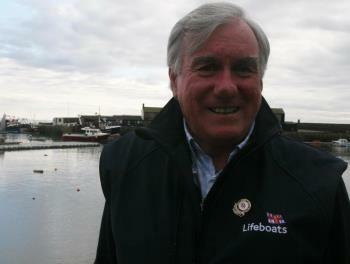 Mr Ken Lavery, a retired head and neck surgeon, has joined the local RNLI team as a Deputy Launching Authority (DLA). Mr Lavery, 67,who recently retired as lead surgeon and Medical Director at Queen Victoria Hospital, East Grinstead, West Sussex, is married to Krys who manages the team of volunteers running the successful RNLI charity shop on the Cobb. They met at the hospital where Krys was a senior ward sister and have two sons. The volunteer crew of the RNLI lifeboat in Lyme Regis said a temporary farewell to their vessel yesterday (Mon) as Spirit of Loch Fyne left the town for an upgrade of its equipment. The four year old lifeboat was taken on a trailer by road and will eventually have a refit at the RNLI’s Inshore lifeboat centre on the Isle of Wight. As Spirit of Loch Fyne left, a replacement boat, number B830 and named Douglas Murray, arrived from the RNLI’s relief fleet. A man who broke his leg after slipping on rocks staggered and crawled for three quarters of a mile for more than two hours in the dark before he was found by a lifeboat crew and his worried wife. 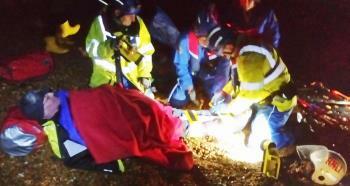 Tim Robinson,54, fell during a walk at about 4.30pm yesterday (Sat) on the beach under Golden Cap, east of Lyme Regis. 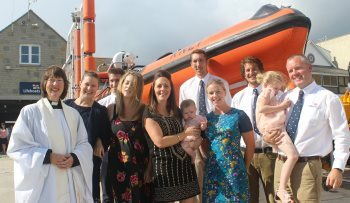 History was made at Lyme Regis lifeboat station today when the town’s vicar conducted a christening service for two children of an RNLI volunteer and his wife. Six months old Lottie and five years old Millie-Rose, whose father Elliott Herbert is a lifeboat helm, were christened by the Rev. Jane Skinner during a service in the boathouse with a congregation of some 70 family, friends and lifeboat crew members. It is thought to be the first time a christening service has been held at any of the town’s lifeboat stations since the lifeboat service began in Lyme Regis in 1826. Not the crews usual mode of transport! and pick up the perfect gift or souvenir! We've got homewares, clothing, tasty treats, toys, greeting cards and much much more. Lifeboat Week 2017 was a great success! Nikky is lifeboat crew newest recruit. Lifeguards on duty - it must be summer! 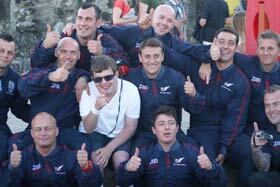 High flyers ...the Lyme Regis RNLI lifeboat crew members flanked by two of the RAF Falcons. Chef Mark Hix and the head chef at his Lyme Regis restaurant, Lin Pidsley, aboard the lifeboat. Compare prices and shop with your favourite stores and a percentage of every purchase you make will be donated to RNLI by us on your behalf. All at no extra cost to you. Donate your unwanted jewellery to be sold in aid of the RNLI Any unwanted jewellery and collectables should be sent to Karen Ketley, Appeal Co-ordinator, RNLI, West Quay Road, Poole, Dorset, BH15 1HZ. 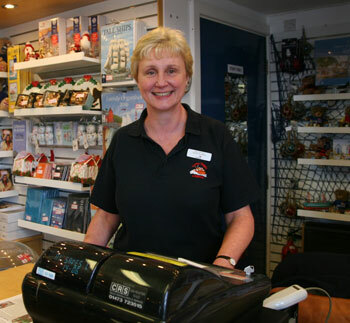 Former RNLI shop manager in Lyme Regis, Mrs Alix Fairley, was voted RNLI Supporter of the Year after the tiny store on The Cobb returned a record turnover and became the best-performing of all 30 shops in the south-west and fifth in the entire country. Alix is pictured with the trophy presented to her at The Barbican in London by Prince Michael of Kent. 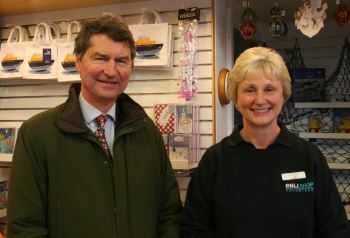 On the left is the new manager of the shop, Brian Cursley who was also invited to the RNLI’s annual presentation event. Alix said: ”It was a truly memorable occasion, and I was delighted with the award which of course is a tribute to all the marvellous volunteers who helped me run the shop. Prince Michael was very friendly and asked us to pass on his good wishes to everyone in Lyme Regis.” Alix was a volunteer at the shop for some five years before handing over the reins to Brian Cursley at the end of last year.